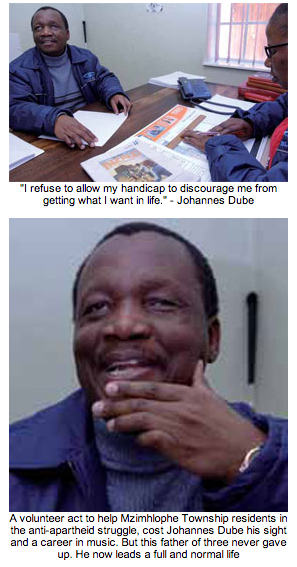 Johannes Dube's promising school career came to a sudden end in August 1976 just after the Soweto riots. He became blind when police shot him above his left eye during a clash with hostel residents. Today, Dube is the national chairperson of the African Language Services Committee at the Braille Services of Blind SA. Born in Soweto, Dube grew up on a farm in Mpumalanga. His family later moved to Gauteng where he went to school. He remembers when he was shot, he felt blood dripping down his face and everything just went dark. "When I woke up I was in hospital. I spent eight months there to recover." After that, he was sent to an eye clinic. It was here that he got the sad news that would change his life forever. "I just had to accept that I was blind," he said. Dube says he owes his life to Glynnis Hugen, a therapist at the eye clinic. She told him that his blindness did not mean the end of his life. "She started teaching me Braille and how to walk with the white stick," he said. There were also other helpers, called mobility workers, at the clinic who helped him to adapt to life as a blind person. "It was a totally new experience for me," Dube said. He was encouraged to learn to type in Braille, which would help him to finish high school. "But the headmaster at Naledi High School in Soweto didn't hide his doubts. He said I wouldn't cope even though I had support from my teachers and fellow learners." 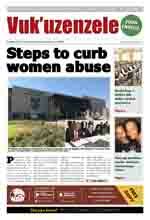 "Just two months before the matric exams, he told me I couldn't write exams," Dube said. He was devastated, but he didn't give up. Determined to finish his schooling, Dube kept on trying and passed his matric in 1983 at Letari High School in Jabulani. He then started studying music at Unisa as he had always dreamed about becoming a musician. But at the time, facilities for blind students were poor and he couldn't complete the course. Dube speaks more than five African languages. This helped him to get a job in 1986 as a proofreader at Blind SA. His main job is to check whether the words on the printed Braille pages are correct and that Braille readers will easily understand the text. He proofreads Braille with the help of Joyce Radebe, who is a sighted proofreader. Dube lives life to the full. "Blind SA has made me what I am today", he said. "I am able to keep my three children at school and I lead a normal life like any other person. I refuse to allow my handicap to discourage me from getting what I want in life."